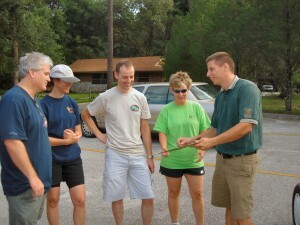 Today at 0800-ish our team assembled at Kelly Park with manager Joe Brandon to discuss the day’s events. We had a very nice chat with him, completed a bit of necessary paperwork and then headed down to the parking area to get prepped for the dive. At this time, it is very, very quiet in the park. We are the first to arrive and the spring run is pristine. The only sounds that can be heard are the soothing rippling of the cool water down the run and the drone of bazillions of hungry mosquitoes waiting patiently for the arrival of human flesh. Right away we unloaded our cylinders and carried them down to the cave entrance. The mossy rocks were still wet with dew making them slippery. We formed a line and passed the cylinders to the end to make things safer. Dive planning is something we always do so we gathered the team together and discussed what each sub-team’s goals were. Mike and Sandy planned to swim to the end of the main passage and turn right at “the hammer” to explore a passage that we had wondered about for some time. Andy and I planned to turn left at “the hammer” and go to the current end of the line that we had run several months earlier. There’s a questionable area of high flow and small passage that needed a bit of time to investigate. 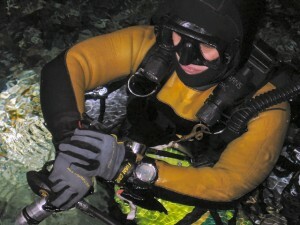 While gearing up, it was discovered that a very crucial piece of equipment, a wetsuit, had been left behind. A quick jaunt was made to my condo (Renee’s) to try and find something that might fit. Didn’t seem likely since the suit needed to fit someone of greater vertical stature than me! As it happened, a perfect suit was located and we left the condo rejoicing headed back to the park. Once there we all wasted no time getting into the water. By now the park was loaded with swimmers and folks curious about the underwater cave. 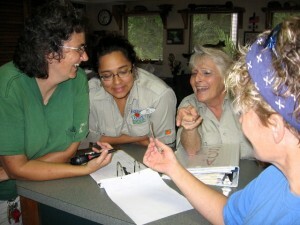 Roxanne who is on staff at the park helped field questions about the cave and why we were there. She did a great job explaining about the positives and also about the dangers of entering caves if you are untrained. 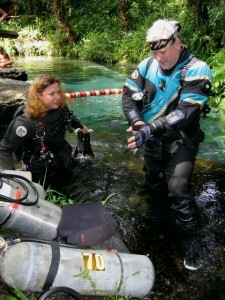 Bob helped hand tanks into the water and recorded pre and post dive statistics. Everyone felt really good vibes about the dive and that is always a good sign! Renee and Andy lead the way taking about 24 minutes to reach “the hammer”. This is actually the farthest point in the main passage, about 600 feet of penetration, where the line “T’s” or divides into 2 different directions. Andy becoming one with Rock Springs! Andy and I each dropped one of our cylinders leaving us each with 2. 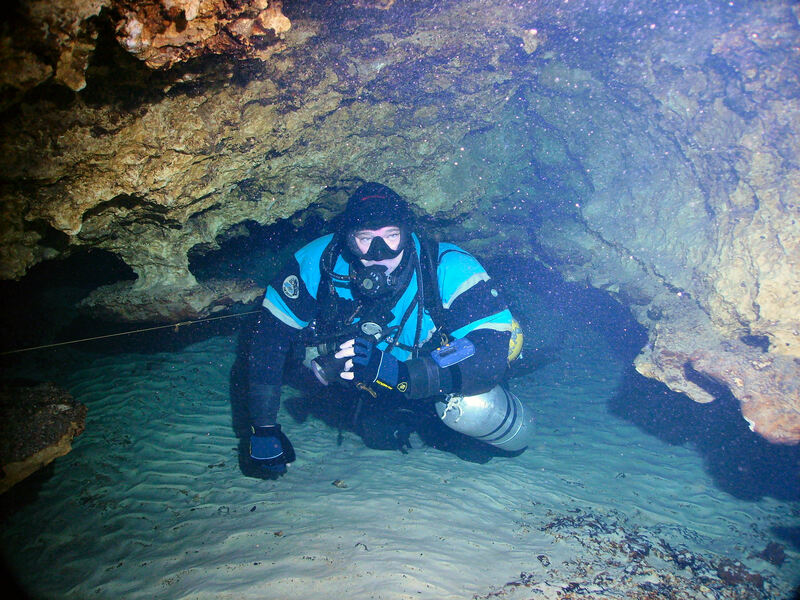 We dive a sidemount configuration meaning that the cylinders are attached on our sides rather than on our backs allowing for traversing through very, very low passages. Seems this is a good choice since this is the design of this portion of the cave! After about 30 more minutes we arrived in the Gator Gullet, very near the end of the line. With Andy up ahead, I noticed that the line suddenly became very loose. I wasn’t sure what caused the line to break but had to take action. This can be a very treacherous situation so I began to secure the line quickly and calmly to avoid entanglement. Also, this is our continuous line to the surface so I wasn’t about to let it go! Within seconds Andy had turned around to help with the situation. We attached the line to his reel, secured the line to a rock and traveled to the end uneventfully. The line was tied off to the rock at the end of the passage only to be accidentally cut again with a cutting device. Well…the line shot between my legs and down the passage behind me in the high flow. I quickly turned to find it with confidence knowing it had been secured only a few feet back. I returned our “way out” to Andy and he again tied it to the rock with a line arrow pointing toward the exit. Opening to high flow passage without Andy in it! Andy tied the reel to the existing line so we could safely move down the slope to investigate the potential lead. The opening was almost large enough to squeeze through but the high flow seemed unwelcoming at best. He spent nearly 20 minutes studying the passage and making various attempts to squeeze through. I took pictures and maintained awareness of our surroundings behind him in case things started to get real dicey. Today, like many other days in this cave, we decided to leave it. We will take some time to ponder the opening, the flow and consider various approaches before attempting again. We decided to remove the piece of broken crockery with the word “Eureka” inscribed on it. 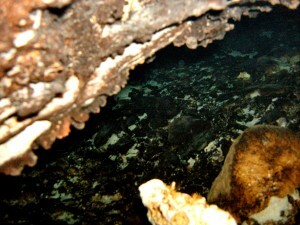 The sinkhole directly above where this is located (see prior updates) was named after this find. 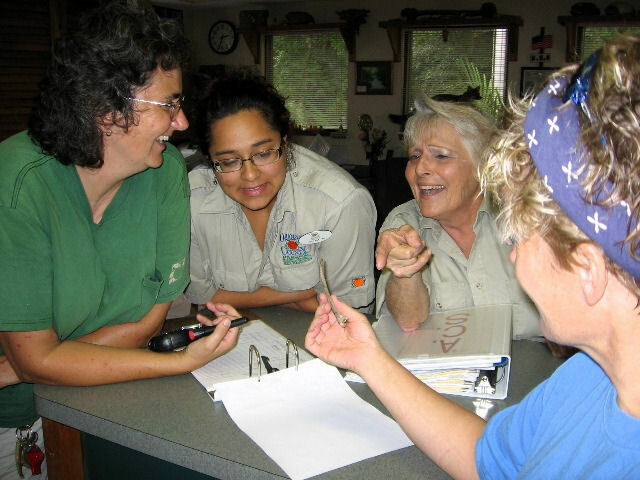 The park staff was very happy to have this and they are going to design a display case for interesting or unusual things that we might find. As always, protocol is followed when an object of interest is located prior to removal. After about 2.5 hours we exited the cave happy to see sunlight but not necessarily the mosquitoes! Mike and Sandra started their dive a few minutes behind Renee and Andy, stopping first to attempt to light the dry cavern area behind the grate so Bob could try and photograph it. Despite rumors to the contrary, there is no large room behind the grate at Rock Springs. The small fissure just gets smaller and eventually pinches out. As they continue up the passage, they stop from time to time to take photos. About twenty minutes in, they catch up to Renee and Andy as they are dropping stage bottles at “The Hammer” and proceed to drop their bottles also. Prior to the dive, everyone agreed to drop stages in the same location to serve as a marker as to who was in the cave and who had left. Let it snow, let it snow, let it snow...WOW! Sandra continued to look for photo opportunities while Mike began to try and push a lead going east from The Hammer. Having checked the lead once before, and knowing it was very small and restricted, Mike elected not to wear his usual sidemount BC, but instead wore a backplate configured to carry tanks sidemount and used his drysuit for buoyancy control. This allowed a lower profile to more easily go into very low spaces. The lead is about 6 feet wide and one to two feet tall. The floor is mostly sand and some clay and is covered with large flakes of limestone that have fallen off the ceiling. Mike notices several fragments of bone (probably dugong?) on the floor and carefully puts them to one side and begins making his way into the passage. Sandy is engulfed in a white cloud of silt as Mike moves farther into the passage. 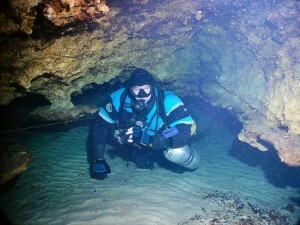 Mike can see about thirty feet into the very low passage and then it appaears to turn to left and maybe open up. There is water flow coming out and the water is slightly hazy and there is white filamentous bacteria suspended in the water. 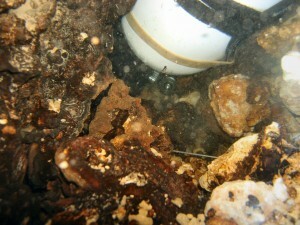 Sandy notices the same bacteria among the rocks outside the passage. As Mike makes his way into the passage, he can see that it is getting even lower as it turns to the left and decides that it may be worthwhile to see if there are any other leads further up the main passage before pushing further into what may be a parallel passage. 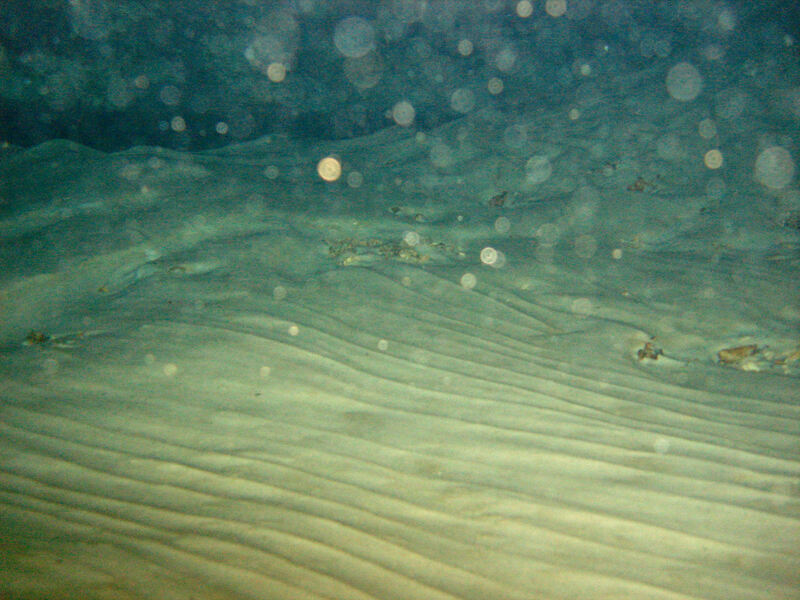 Total survey for the day: 25 feet and 13 feet of depth in a passage six by two feet. Park staff make no bones about it...that's a bone! Moving back into the main passage, the tremendous flow hits you like a freight train. The water seems to actually roar past you. No sign of Renee and Andy yet, so Mike and Sandy gather their stages and ride the flow back out. With all the activity, visibility is now only about 10 feet but still plenty to exit. We stop briefly near the exit to make some adjustments to the main line and to look at the dry cavern area some more. There is only one area where you can get your head out of the water and no sign of any large rooms. We noted only one armored catfish near the exit. The lifeguard at the park tells us the otters are moving in and catching them to eat. It’s nice to see nature adjusting to an invasive species. 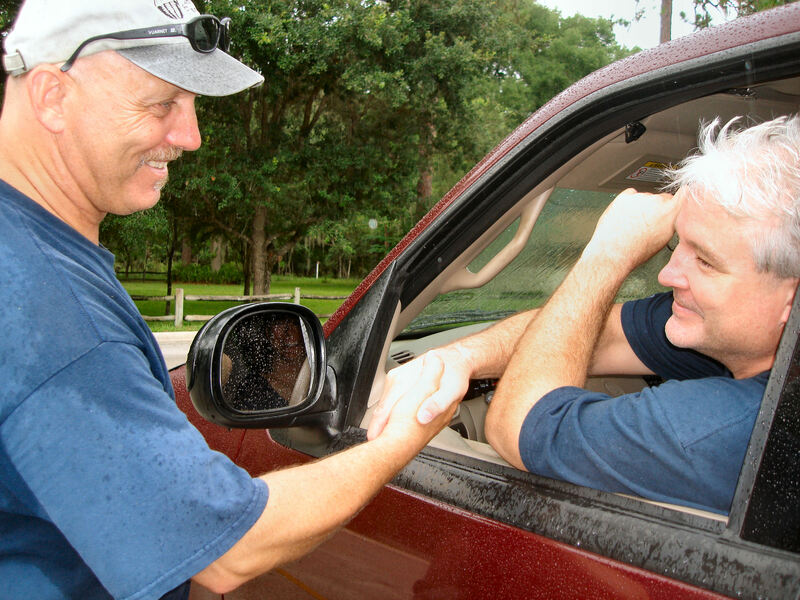 Thank you Bill and Laura at Seminole Scuba for helping us out with air fills for the project. It’s great to know you guys are there for us! !